Have you ever worried that Captain America won’t survive to see the end credits in the movie named after him? Do you think Spider Man really isn’t going to be okay? Of course not. These are unspoken agreements that Marvel Studios has made with us for the last 10 years. We don’t ever have to really worry about their invaluable character’s well-being, and Marvel gets to keep pumping out sequels. That’s the deal, and both sides (especially Marvel’s) are totally fine with it. It takes approximately 10 minutes into “Avengers: Infinity War” for that deal to be broken. This truly massive production not only brings more than 20 characters together, it also does something that none of the 18 movies before it could do: create life or death stakes for every single character. Needless to say, the film won’t be spoiled here, and knowing more than basic story elements should be avoided at all costs. Don’t let the staggering 149-minute run time scare you off. 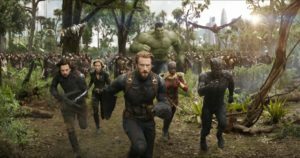 That may seem like a titanic amount of time to spend watching a comic book movie, but “Infinity War” simply needs every second to juggle multiple story threads, and there’s nary a scene that could be removed for time purposes. This movie is miraculous work by brother directors Anthony and Joe Russo, who will assume the same responsibilities for the second film that picks up where “Infinity War” ends. And boy, what an ending. The final 15 minutes of “Infinity War” is a series of gut punches that will be discussed ad nauseam. Everything that comes before it happens so quickly that the movie flies by, and the final moments should leave people dying for more. There is no getting around the fact that you simply must be familiar with events from previous films to understand what is happening in “Infinity War.” The simple explanation is that Thanos (Josh Brolin) is searching for the powerful Infinity Stones so he can use them to shape the universe as he sees fit. His motivation, which won’t be spoiled here, is extremely dark for a Marvel movie and could actually scare the bejesus out of some younger kiddos. All the big names show up to defend the universe, and the interactions of characters that haven’t shared the screen before are a blast. It doesn’t take a guy with a baker’s dozen worth of Spider Man T-shirts to get excited watching Peter Parker (Tom Holland) go to outer space with Tony Stark/Iron Man (Robert Downey Jr.) and then meet up with Peter Quill/Star-Lord (Chris Pratt). That’s cool no matter your level of investment in these characters. The Russos quickly move from locale to locale, with the main ones being Wakanda and Thanos’ home planet Titan. A massive battle takes place on the former, with Steve Rogers (Chris Evans), Black Widow (Scarlett Johansson) and T’Challa/Black Panther (Chadwick Boseman) leading the charge. Fortunately, it’s not overblown, and every character gets a handful of moments to shine. The movie does mix in heavy portions of heart and humor and Chris Hemsworth’s Thor seems to stand out a bit more than others. Fresh off his finest outing as the character in “Ragnarok,” Hemsworth keeps the good vibes going and with ample doses of clever one-liners and almost all of the emotional heft. “Infinity War” really works because Josh Brolin and writers Christopher Markus and Stephen McFeely have crafted the greatest comic book villain this side of Heath Ledger’s Joker. The CGI is impeccable, and Brolin’s growl is shockingly relaxed, only adding to his hulking menace. He looks and sounds unbeatable and everything about the character makes you believe that he could actually be victorious in the end. It’s odd to say at this point, but “Avengers: Infinity War” is the movie that comic book aficionados have been waiting to see. This is red meat for Marvel fans and they are going to devour it again and again. It is the perfect blend of action, comedy, emotion and is the first Marvel movie not afraid to go to a very dark place.